May 19th, 2012: Calling all aspiring Steven Spielbergs, budding Andy Warhols and J.K Rowling wannabes Aflamnah, a phenomenal crowd-funding website that allows individuals to raise money for fresh ideas is set to be the first such initiative to launch in the Middle East. The concept, brand new to the region, is designed to help talented individuals fund a wide range of ideas that includes film, television, art, music, photography and fashion from passionate like-minded individuals pledging support to help bring their idea to life. Aflamnah has been created to encourage people in the Arab world with a dream to think bigger and bolder and inspire and engage the public to get behind an idea from the beginning to help it reach a wider audience. In a bid to build on the incredible talent and creativity in the region, Aflamnah focuses on projects for the Arab world by Arabs or by individuals or organisations that care about cultures, societies and people who reside in any of its countries. The crowd-funding platform that launches on July 1 aims to turn fantasies into reality and enrich, inspire and educate all those involved. The initiative hopes to change the way creativity in the region is conceived and hopes to encourage a new generation of directors, geeks, artists and story tellers to pursue their passion. People must post the information related to their idea via the Aflamnah website and once the idea has met with the guidelines they are given access to make their project live on the site. Their idea has to meet a self-assigned target within 28 days. If a project doesn’t meet its goal, no money is exchanged. Aflamnah has no ownership over the projects and acts to help support projects to get successfully funded. Aflamnah already has 4 confirmed projects that it will launch with on July 1. These include award-winning director, Annemarie Jacir’s new film When I Saw You which has almost finished post production and will be seeking funding for its distribution strategy. First time director, Dima Hamdan’s award-winning crime thriller script The Kidnap which is in final stages of development. Vancouver-based Syrian-Canadian filmmaker Amar Chebib is seeking postproduction funding for his documentary Music, Politics and Ecstasy. And author, director, critic and film industry veteran Viola Shafik’s feature documentary Scent of Revolution which commences post production in July. Aflamnah has been set up in partnership with Virtuzone, Fujairah’s Creative City Free Zone in the UAE. 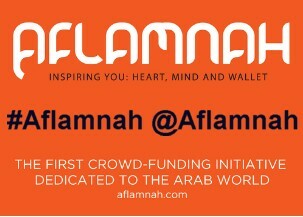 ABOUT AFLAMNAHAflamnah is the first digital platform dedicated to crowd-funding in and for the Arab World. It aims to help independent filmmakers, artists, geeks, students, innovators, thinkers and more to raise funds for their projects within 28 days by getting people excited enough to financially support their idea so that they can make it happen. Aflamnah is for anyone who has an idea for the Arab world by Arabs or by individuals or organisations that care about cultures, societies and people who reside in any of its countries. It is also for anybody anywhere in the world who would like to support these projects because they fall in love with an idea, they just want to give something back to the community or they are helping someone they know or just because they want to.